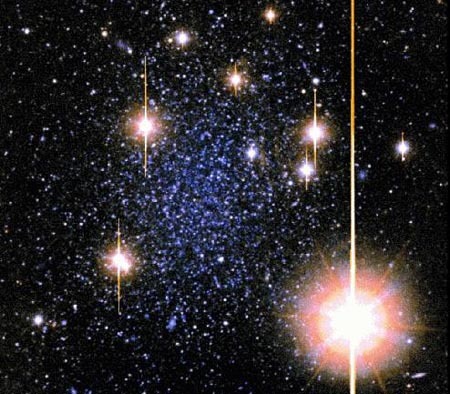 The last eight dwarfs (small galaxies) are in the direction of the named constellation, but the stars of the constellations are in our own galaxy. In addition, dwarf galaxies seem to have a higher ratio of Iron versus globulars. What that means is not entirely clear, but indicates that some newer stars must also have existed within the dwarf in the past. These dwarf galaxies are beyond the view of the unaided eye, and though a telescope might be confused as a globular clusters. 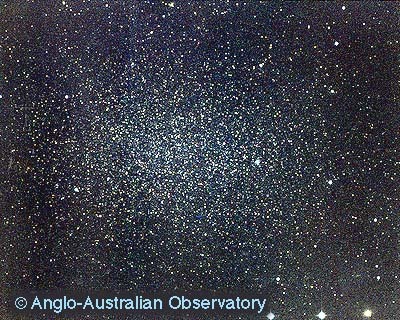 But there are two satellites that are unmistakable: The Large and Small Magellanic Clouds. These two irregular galaxies reside in the Southern skies and therefore hidden from view to those of us in the United States, Canada and Europe. This galaxy is classified as an irregular galaxy that may have tiny arms. Its distorted shape is though to be the result of the gravity from our galaxy. 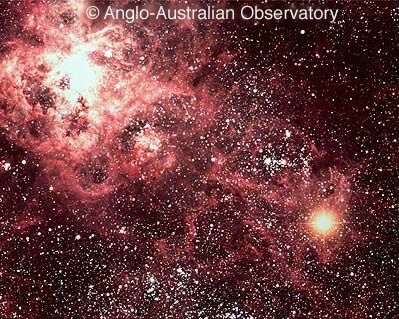 The Large Magellanic Cloud is host to the Tarantula Nebula and the very important supernova remnant of SN1987a - the supernova that proved a flood of neutrinos does emanate from the dying core. A nebula like this, containing a large amount of dust and hydrogen, is though to be a nursery for new stars to be born. 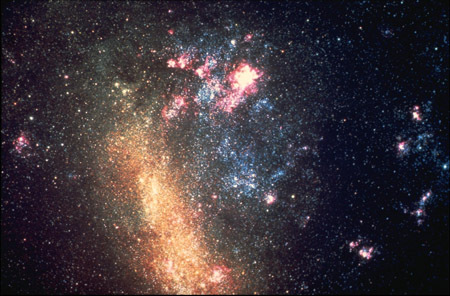 The Small Magellanic Cloud has its own share of notoriety. In 1912, Henrietta Leavitt discovered a period/luminosity relation of a newly discovered variable called a Cepheid variable from within the Small Magellanic Cloud. Her discovery would allow the accurate measure of long distances by using the Cepheid period/luminosity as a ruler. 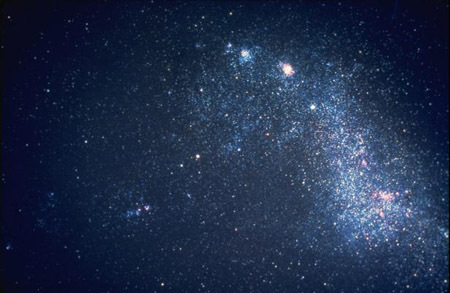 The Small Magellanic Cloud (above) is also considered an irregular galaxy, but does not have the near distinct central bar or arms of the Large Magellanic Clouds.